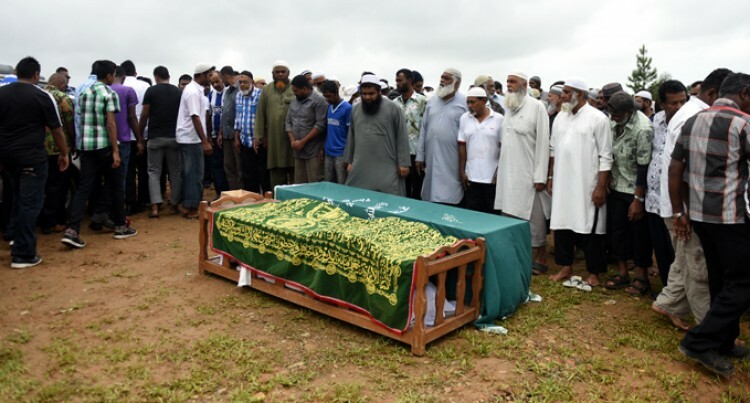 Navosai, Nasinu fire victims Imran Ali (30), and his wife Faria, (22), were buried at the Nasinu Cemetery yesterday. More than 300 people joined relatives and friends to farewell the couple who was among four people who died in the fire early Friday morning. Mr Ali, a taxi driver, and his pregnant wife, a teacher at Lami Primary School, died in the fire which destroyed three flats at Navosai. The owner of the flats, Jai Narayan, 54, and his granddaughter, Prishika Devi, 10, also died in the fire. Mr Narayan’s daughter Uleshni Irene Lata, 28, remains in critical condition at Colonial Memorial War Hospital, Suva. The family renting another flat managed to flee the fire. The couple had earlier planned to host a family gathering, prayer and celebration yesterday at their flat. They planned to invite Mrs Ali’s parents who live in Nadi and surprise them and relatives with the pregnancy news. The fire doused the good news as relatives bid them farewell at Nakasi, Nasinu, yesterday. The late Mr Ali’s parents live in the United States. Speaking on behalf of his wife’s parents, his aunty Amina Bibi said: “Faria did not tell her mother that she was pregnant. “Yesterday Faria’s mother would have to visit her and they would tell her about her pregnancy. “Faria had plans to have dua (prayer) and then give the surprise to her mother,” she said. The late Mr Ali was from Kinoya. The couple met in January, fell in love, got married in August and had their wedding reception last month. Mr Bibi said: “They love each other very much. Faria was a very nice person. She used to socialise with everyone and knew how to win people’s heart. She was a very cheerful person and hardly gets angry with anyone. “Imran was a very kind and caring husband. He looked after his wife very well and always make her happy. “I did not know about the incident, but when I was at work on Friday, my brother informed me go to the burns unit at CWM Hospital. Ms Bibi fought hard to control her tears. “It was not their fault. They were only renting in the house and they used to visit us every Sunday. I ask people to pray for them and may their soul rest in peace,” she said. Meanwhile, Police spokesperson Atu Sokomuri said Ms Lata remains admitted in hospital and two men are in custody as investigations continue. Funeral arrangements are also underway for the late Mr Narayan and his grandchild.